All I can say is.... yummy! And they're even better in person. The first thing that came to mind when I saw these was a juicy creamsicle. Even prettier after giving them a bath in etching solution to enhance the creamy look and feel. 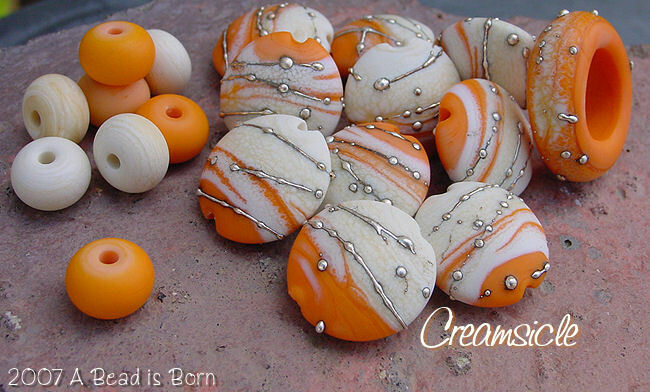 This set consists of 10 ivory and tangerine lentils, with silver whips throughout. You'll also get a great matching slide bead, and 8 accenting round spacer beads. Lentils measure 17X17mm, the slider bead measures 15mm (inside hole) 23mm in diameter. Round spacer beads measure about 7X9mm.